In his address to the Republican National Convention today, Ricky Gill, who we can only presume is a Sikh American running for Congress in California’s 9th Congressional District, passed on the unique opportunity to acknowledge our visible minority — whose recent turmoil in Oak Creek, Wisconsin occurred not a month ago — on the national stage. In his speech, Gill disappointingly neglected to make any reference to his Sikh background, instead naming “India and Africa”. This follows a trend with Gill in that he has never openly acknowledged his Sikh faith, and instead, appears to make every effort to downplay this background. Despite this reluctance, the Sikh American community, which has become very topical given the mass shooting at the Oak Creek, Wisconsin Gurdwara earlier this month, has been one that Gill has solicited heavily for campaign donations. He comes from a Sikh family, and the district he seeks to represent contains the oldest Gurdwara (Sikh house of worship) in the United States, in Stockton, California. The Central Valley of California is known for its large and historic Sikh American population. Ricky Gill at a Sikh community fundraising event in Southern California, August 2012. The tragedy is, of course, that Sikhs in California who hope he would provide a voice for the community in the federal government have supported him significantly, but Gill fails to honor this moral contract. If we needed any evidence of Gill’s inability or unwillingness to be that representative, we now have it. Gill is technically the first Sikh (again, an assumption) to address the Republican National Convention, having presented to the delegates one day before Ishwar Singh, the President of the Sikh Society of Central Florida, provides the Invocation tomorrow. It has actually been written in the media that Ishwar Singh is the first Sikh to address the Republican National Convention, and for all intents and purposes, and as far as Sikhs are concerned, I would acknowledge this to be the case. Gill’s remarks to the Convention are available here, and quoted below. My name is Ricky Gill, and I am humbled to stand before you today as a Republican nominee for Congress – and a proud son of California’s San Joaquin Valley. My parents immigrated to the Valley from India and Africa with only their love for each other, a strong work ethic, and the enduring desire to pursue their American Dream. We all work hard in the Valley, and we’re proud to live there. But today we face crippling unemployment and foreclosures-even the bankruptcy of Stockton, our largest city. Young people leave — or drop out of school to help their families make ends meet. Our friends and neighbors are suffering. But the Valley is a cautionary tale of failed policies, not false ambitions. No one in this country dreams of dependency; no one hopes for mediocrity. We are ready again to seize the measure of our ambitions – not because the government says we can, but because we believe we can. We need a new generation of leadership to chart the path – to fight for policies that create jobs, rather than red tape — and to help small businesses succeed, rather than helping green energy companies fail. Like you, we Valley folks are tough, independent, and faithful – and we are ready to rebuild our American Dream. A moral contact? So, a politician is morally obligated to represent his religious or ethnic background? When a politician has used that background as a means to solicit large-scale financial donations and votes, then yes, I believe anyone with a sense of morality should feel compelled to represent the people that supported him or her. Secondly, let alone representation. Why is Ricky Gill refusing to even acknowledge his Sikh background, or to simply say the word “Sikh” to the mainstream public? I am sorry but you are blurring the line between representing people’s interests and representing an ethnicity or religion. This is not what he is standing for as a politician and unless of course he disowns his Sikh heritage and connections, your case against him for failing to pass a “Sikh test” is very insulting. It is simply this: why has he not made one public statement in which he mentions that he is Sikh? And, if being honest and transparent about his background is not what he is standing for as a politician, why is he intentionally soliciting donations at Sikh-oriented fundraisers, Gurdwaras, and other Sikh-oriented groups outside of his district? And, when he attends these fundraisers, why is he not discussing them on his Facebook page, Twitter feed, or campaign website? There is not a single picture of him with a Sikh, or mention of it, from his campaign anywhere? Yet, behind the scenes he is courting community support. Members of the Sikh community are giving him their hard-earned cash to support his campaign. He is taking their money and apparently turning his back towards them. This is not about passing a “Sikh test”. This is about an apparent intentional strategy to obscure an association with the Sikh community in and outside of his district, while at the same time soliciting money and support from them. As a Sikh American, I find THIS insulting. Our community should not be treated by anyone in this way, much less by one of our own. I get where you’re coming from. You can’t rely on the Sikh community for support and then ignore them when you’re in the limelight, especially when the need for more awareness is so intense, given the recent unfortunate incident in Wisconsin. If that wasn’t the case, I’d have agreed with the commenters above that he is under no obligation to publicly mention his religion/background. But you know, this is politics. He’s only going to say/do what will get him the most votes, and he may think that if highlighting his Sikh background will prevent his constituency from connecting with him/wanting to support him. I agree, he is certainly under no obligation if he has not relied on community-specific fundraisers. But, it is disturbing that when he is asked about his background, he never acknowledges being Sikh – immigrant, Indian, African are seemingly acceptable to mention. I am interested to know why this is the case – is acknowledging being a Sikh a political landmine – especially in a district with such a large and historic Sikh population? And, if so, is appeasing this not continuing that discrimination and marginalization of the Sikh American community? I find your allegations of “discrimination” to be quite overweening and self-serving. Has he denied Sikhs to be part of his campaign staff? It is like someone who is guilty until proven innocent that too because he hasn’t called himself a Sikh or hasn’t posted a picture with a Sikh. How is this discrimination? And, If he is solicitating money for election from religious places then please call the IRS as it is illegal per federal law for religious organizations to support and solicit donations for the candidates. Unless he gets sworn in using a Bible like Haley, you simply have no case against him my friend. 1. Ricky Gill has solicited campaign donations specifically from Sikh Americans. This is undeniable. His presence at fundraisers held by the Sikh community all over California to his benefit is factual. He has benefited from Sikh community support in, and particularly outside, of his district. 2. Despite the above, Ricky Gill refuses to use the word “Sikh” anywhere. He maintains silence about his religious background. When asked, he acknowledges Indian and African roots. He has not, as far as I’ve ever seen, mentioned that he is a Sikh. When he expressed his two sentence statement of condolence about the killing of Sikhs in Oak Creek, Wisconsin, he did not, even then, use the word “Sikh”. Mitt Romney acknowledges he is Mormon. Even Nikki Haley asserted her religious identity. Ricky Gill is glaringly silent about his faith. 3. 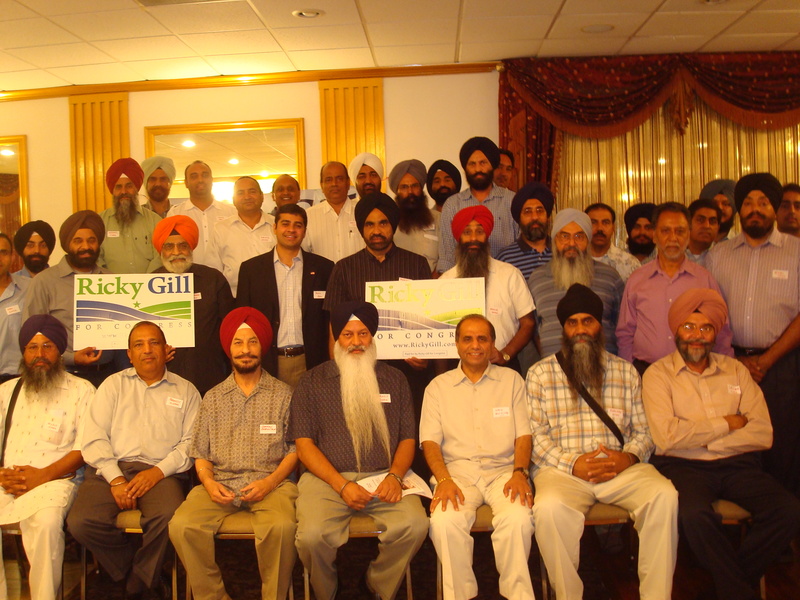 Despite the solicitation of campaign funds from the Sikh community all across California, his campaign has never put up a photo of Ricky Gill at one of these events, nor can you find a single photo among the many photos on his campaign website, Facebook page, or Twitter feed of him with another Sikh (aside from his mother). There are many photos of him with Caucasians and other communities, but none with Sikhs. That he is – at the very least – not publicizing his interactions with the Sikh American community is inequitable treatment of this community by him. This is the basis on which I use the word “discrimination”. If he is not intending to provide Sikhs representation, he needs to make that clear at the fundraisers held by Sikhs. Has he made any such statement? You are free to debunk anything I have said. I’ll even tell you how: show me where his campaign website or social media sites show Ricky Gill with other Sikh Americans. Show me a statement by him in media in which, when asked about his background, he uses the word “Sikh”. This should not be hard, as he is one himself, I am sure he has encountered many Sikh Americans during his campaign. If you cannot find any, then obviously there is an attempt by his campaign not to publicize his interactions with Sikh Americans. If the counter to my assertions here is that he is a politician and has no responsibility to represent the Sikh community, you have made my point and he should make this clear at his next fundraiser organized by a local Sikh community. However, it still does not explain why he refuses to use the word at all. If Ricky gets money from those who happens to be Sikh he is not morally obligated to represent each and every one of them. Money only gives access to a politician and nothing else. No politician is morally obligated to return favors and there is no ethical misconduct on his part. The contributors should make their own wise decisions. On the contrary,you haven’t proved that Ricky has solicited money in the name of religion and ethnicity. Unless interests of Sikhs are a special part of his agenda and he is misleading Sikhs and extorting money from them in the name of religion your allegations against him for being immoral and dishonest are presumptuous. The evidence is all there. Ask the Sikhs in Southern California who held an event for Gill two weeks ago. Ask his father if he believes the Sikh community has given his son enough support. Whether you choose to see it or not is your choice. Issues about representation aside, none of what you said explains why Gill hides his own Sikh background from the public. Hi, thanks for writing this. It was needed. It’s obvious this guy is an opportunist. If he is soliciting Sikhs outside of his district for money yet he feels embarrassed of his Sikh background. Is that who you want to elect in office? Sikhs should not waste their vote or hard earned money on him. Make your vote count. Correct me if I am wrong, but I believe Ricky is of the Catholic faith. I live in his district and have been around him and his campaign some. Regardless, the support of the Sikh community has been incredible, as his conservative worldview is congruant with the Sikh mindset. Go Ricky! Interesting — to my knowledge he has never openly acknowledged being a Catholic either. In photos, he wears a steel bracelet on his wrist, which is a Sikh article of faith. How is his conservative worldview congruent with the Sikh mindset? Ricky Gill is a coconut. just like Niki Halley and ‘Bob’ Jindall. The Republican party will insist on them denying their identity and pressure them to convert from a ‘heathen’ religion. This is not progress. This merely reinforces the stereotype that Hinduism (and hence Sikhism) are primative religions not on the same status as christianity. The colonial and imperialistic nature of christianity lives on. Who is a Sikh is clearly defined in the SRM, the Sikh Code of Conduct. A Sikh is a person who holds certain beliefs and doesn’t owe allegiance to some other religion. Being a Sikh is not about what family you were born into or your parents’ religion. It is personal and pertains only to the individual. I really don’t care whether Mr. Gill is a Sikh or not, but if I wanted to guess, I’d look at his stated beliefs and his actions and see if they coincide with the beliefs of the Sikh religion. Nanak Naam Chardi Kala, teraa bhane sarbaht da bhala.